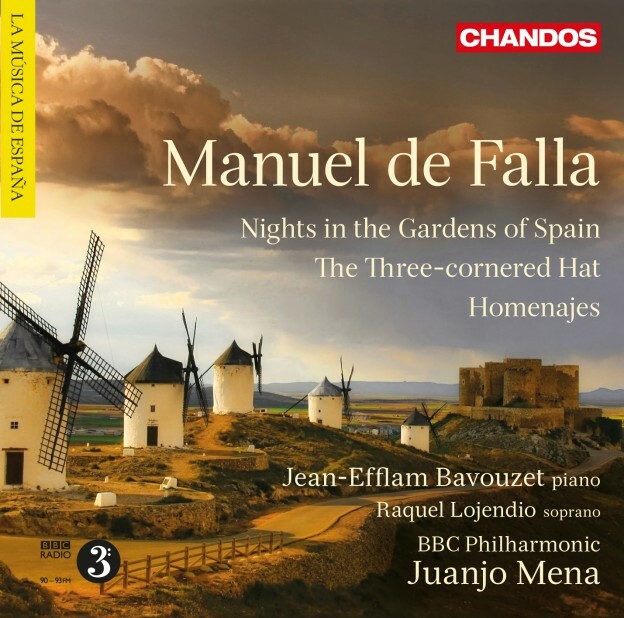 This disc of works for stage and concert hall by Manuel de Falla starts off Chandos’ new Spanish series with the BBC Philharmonic under Juanjo Mena. Nights in the Gardens of Spain is among Falla’s most impressionistic and poetic works, full of shimmering textures that recall Debussy, but with a hard-edged precision brought to the forefront by the piano. Based on the novel by Alarcón, The Three-cornered Hat was commissioned in 1916 by the impresario Diaghilev for his Russian ballet company. The music is exuberant and vibrantly colourful – a great chance for the BBC Philharmonic to be put through its paces. Also on this disc is the Homenajes, in which Falla pays tribute to fellow musicians and composers. ‘Fanfare sobre el nombre de Arbós’ was written for the seventieth birthday celebrations of the conductor Enrique Fernández Arbós, while ‘Pedrelliana’ pays posthumous homage to Falla’s teacher Felipe Pedrell, who had informed so much of his musical thinking. "The programme presented here would seem to be the perfect calling card for the BBC Philharmonic’s new chief conductor, Juanjo Mena. And so it is. The natural affinity for this repertoire that the Spanish conductor possesses is obvious from these performances. The selection of three of Falla’s best orchestral works makes this a valuable addition to the composer’s discography. It also marks what is hoped to be just the beginning of many recordings of Spanish music from Mena and the orchestra…one of my favorite discs so far this year. Bravo to Mena and the BBC Philharmonic! Chandos, Mena and the BBC Philharmonic have scored a success in the music of Falla."